John Ryan: one of seven Munster changes. JOHN RYAN RETURNS to boost the Munster pack for tomorrow evening’s Guinness Pro14 trip to face a strong Scarlets side [kick-off 5pm, TG4 & eir Sport]. 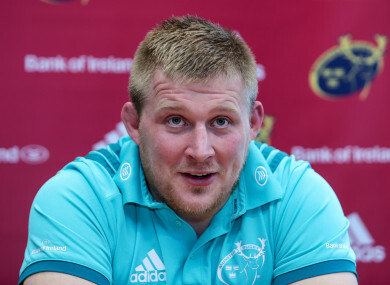 The Ireland prop, who played 17 minutes off the bench in last weekend’s win in Rome, has been released back to the province by Joe Schmidt and starts in the front row. Ryan’s inclusion is one of seven changes made by Johann van Graan to the side which beat Ospreys to keep Munster on top of Conference A. He is joined in the pack by Jean Kleyn, who has recovered from the illness which forced him out of last week’s win, and Conor Oliver who takes his place in the back row. Bill Johnston and Alby Mathewson form a new-look pairing in the half-backs, 25-year-old Rory Scannell becomes the youngest ever player to reach a century of appearances for the province, while Ronan O’Mahony starts on the right wing. Hosts Scarlets can call on five of their Welsh internationals for the clash with Leigh Halfpenny, Wyn Jones and Ryan Elias all named to start while Rhys Patchell and Steff Evans are among the replacements. Regular skipper Jake Ball remains with Wales and is replaced in the second row by Lewis Rawlins. Email “Ryan back in red as Munster make seven changes for Scarlets trip”. Feedback on “Ryan back in red as Munster make seven changes for Scarlets trip”.